I was supposed to go camping with my daughter this weekend while the wife was down in Southern California. She applied for a job online Thursday night and got a call Friday morning to come in that same afternoon to start training. Either she had a killer resume for someone who's never held a job or Blaze Pizza is somewhat desperate. Or maybe just she was just in the right place at the right time. In any event, she would spend the weekend continuing her training so I decided to head out to do some local hiking. I was interested in an obscure summit called Corinda Los Trancos at the SE end of Montara Mountain in San Mateo County. I had visited the nearby and higher Scarper Peak (a P1K) more than seven years earlier, but Corinda Los Trancos had remained elusive and looked to be heavily overgrown with dense brush. The route I had used for Scarper had been done at night, all on private property, featured some scary dogs that we met up with on our return and I had no interest in repeating it. 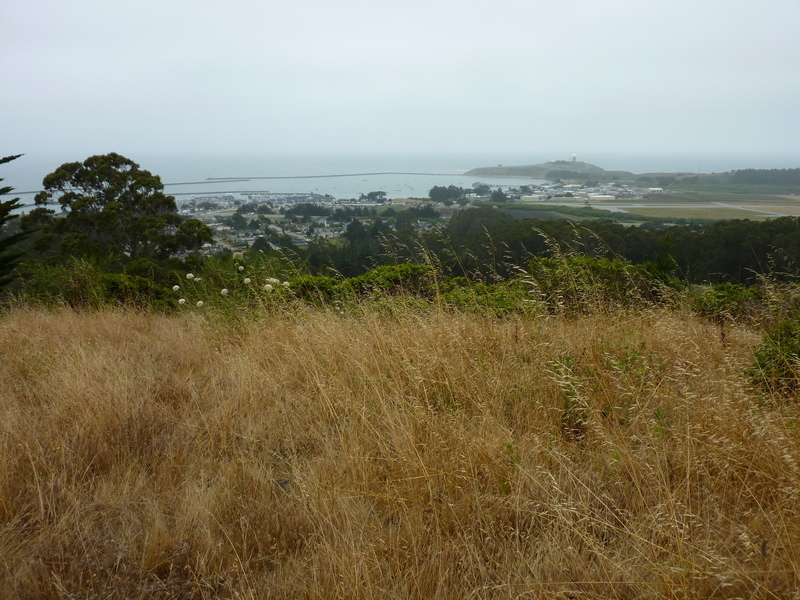 Since that time, the Golden Gate National Recreation Area (GGNRA), managed by the NPS, has acquired parcels of land to the southwest called Rancho Corral de Tierra with some trails that offer a better alternative. Adjacent to this and encompassing Scarper's summit, the Penninsula Open Space Trust (POST) has acquired its own parcel though it doesn't appear to be open to the public. Corinda Los Trancos still lies on private property, but the new NPS and POST additions offers a way to avoid the dogs and busier parts of my first route. Andrew Kirmse posted a GPX track on PB that showed this alternate route that I would follow. My track makes a key improvement to this, but it requires trespassing on SF Water District lands - pick your poison. The weather was far from ideal. Not atypical for this time of year, Montara Mountain was steeped in a heavy fog that left the place dripping with moisture. I would have soaking wet pants and boots for most of the five hours I spent on the outing and views would be minimal. I may have ruined a camera with the moisture as well. I got to the GGNRA Trailhead at the end of Almeria Ave above Half Moon Bay's harbor by 9a and started off below the fog ceiling. This allowed for some modest views towards the coast and Half Moon Bay in the first mile or so, but it would not last as I soon moved into the fog layer itself. The trail begins as a nice, open single track but soon becomes more overgrown as one gains elevation. The overgrowth was wet with the morning dew/fog and slowly began to wet everything below waist level. The banana slugs and newts found this to their liking, but me - not so much. At an old fencepost I found a small tribute (or more like an anti-tribute) to our beloved President. I could feel America's renewed greatness overwhelming me as I held it up to examine it. Somewhere about the first hour I passed through the GGNRA/POST boundary, no signs or gates to make it obvious. I followed an old road past a shuttered gunclub building within the POST property, the road eventually devolving to a seriously overgrown path. It might not have been so serious in dry conditions, but today it was the section that would ensure my feet would be swimming inside my boots. This continued for about a mile, all the way to Scarper Peak. I could see on the track I followed that Andrew had shortcutted this crappy road with the paved road above, but I stuck it out to the proper junction because there is a great deal of poison oak that I didn't want to wade through. This upper part of the mountain is wet but very green and lush, more like the temperate rain forests of the Pacific Northwest than the dry California coastal ranges one expects. At the gate to the formidible fence around the summit towers, I noticed there was an 8" gap at the bottom that would make it easy for a fairly skinny person to slip inside. Were one to do so, it would then be a cinch to walk around the summit buildings to find the highpoint - much easier than more wading through poison oak going around the fence's periphery. After leaving Scarper, I paid a visit to nearby Ox Hill. It really has no business having an official USGS name of it's own since it has almost on prominence, views or other redeeming qualities. But it is an easy diversion off the pavement just east of Scarper, so there you have it. There are truck tracks going through the grass to the summit and then over the east side. I attempted to follow the route traversing over the summit, but that turned out to be a mistake as I eventually found myself wallowing in poison oak and heavy brush requiring me to backtrack the way I'd come. Back on the pavement, I followed it downhill to a saddle and junction east of Ox Hill. Corinda Los Trancos is only 0.8mi southeast of this junction. The pavement heads downhill to the nursery and dogs found at the end of Frenchmans Creek Rd. A dirt road branches left, continuing along the crest towards the last summit. A yellow gate, soon encountered, marks the boundary with private property. This wide road sees little traffic but appears to be regularly maintained, wide and clear of vegetation. Nearing Corinda Los Trancos, I missed the turnoff described by Andrew on the west side. Checking the GPSr regularly, I didn't get far before I noticed this. I returned and found the obscure junction for an old roadbed that heads to the summit in something like 1/5mi. Though much better than the alternative bushwhack, the road is terribly overgrown and today, terribly wet. I sloshed though thorny shrubs and under partially fallen trees, all hung with vines and moss and such stuff. It took me some minutes of stomping around the summit area to find the lean-to against a large tree that Andrew had used to mark where he left a register in a plastic tub. Though not even four months old, there had already been a second party in the way of Kyle and Kerry Breen just a month ago. It would be laughable if this summit became moderately popular only because every visitor will have their own version of the ridiculousness of it all. Such silly people, these peakbaggers.